In the only video at the bottom of this story featuring Brandon Smith from Alt-Market.com along with Sean from Sgt Report, they discuss current events in America and all across the world today with this very heavy theme in mind that we all should embrace and peacefully act upon: We are the very last line of defense against global government and the ‘new world order’ and a boot stamping upon our faces, forever. 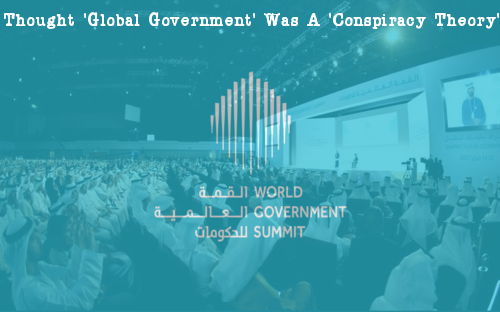 While despite the fact that global government has now been admitted to at the very highest levels of said government with the World Government Summit held back in February in Abu Dhabi and focusing upon artificial intelligence among other things and featuring a very heavy Islamic theme as seen in the Gif image we’ve created of the conference below, the mainstream media refuses to acknowledge such government, leading to millions of Americans who still get their news from them oblivious to that reality. Yet as Brandon and Sean tell us, those who’ve been paying attention to reality and get their news from sources other than traditional mainstream media understand that we’ve been watching ‘global government’ being unfurled before our eyes for quite some time now and sadly, rather than being a global government that supports the freedom of expression and non-traditional ideas, said global govt is totalitarian in nature. Such has been the U.S. political consensus on NATO that, since the alliance’s creation in 1949, criticizing America’s membership was akin to advocating the abolition of child labor laws: It simply wasn’t done by serious candidates seeking the presidency. Trump changed all that. Among the many taboos he broke during the 2016 U.S. presidential election, Trump went so far as to call NATO “obsolete,” and since taking office, he has repeatedly questioned America’s security commitment to treaty allies. Although U.S. presidents of both parties since Harry Truman have supported the political and economic integration of Europe, Trump supported the United Kingdom’s decision to leave the EU. With the entire global government apparatus apparently ‘never Trumpers’ helping to explain the non-stop mainstream media attacks against him and the entire ‘deep state apparatus’ treating him as though President Trump and his ‘America first’ agenda are ‘public enemy #1’, Sean and Brandon take a look at ‘what might have been’ had Hillary Clinton been elected while proving just how close America still is to ‘falling’. And despite the overwhelming evidence of global government, why does the mainstream media apparatus continue to call ‘global government‘ a ‘tinfoil hat conspiracy theory‘? As we hear in the video and read in this recent story over at Alt-Market.com, the truth of the matter is the corrupted faction of the deep state and the entire ‘establishment’ have long been sacrificing America for what they considered a ‘greater good’, their luciferian ‘new world order’. There is a disconnect within the liberty movement over the notion of where to find the root source of globalism. A segment of people within the movement seem to think that the fount of globalism resides within America itself; that American imperialism is the foundation of the globalist scheme and the dollar is the single most important mechanism supporting their power. This is an naive oversimplification of the problem. In order to understand what is happening and why, we must cast off the lie that America is a golden goose that perpetually supports the globalist agenda. Rather, America is more like a host to the globalist parasites, and once the host is drained of all vitality, the parasites will leave and move on to bigger and better targets. In other words, just as numerous empires before it, the U.S. system served a purpose for a particular window of time. It was exploited as a means to an end, and now the banking elites are moving on to a “new world order” in which America plays a far diminished role. This is why the Fed continues to act in a manner that appears bewildering to so many people. This is why the Fed is taking actions that they have openly admitted will cause a crash. They WANT a crash. Donald Trump fits the bill perfectly for a number of reasons, but the ultimate scapegoat for a crash of the U.S. system is not Trump alone, but the conservative ideal overall. 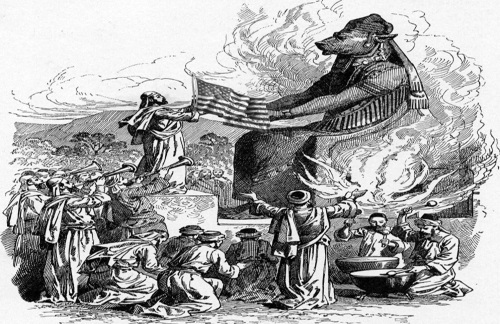 The image that Smith embedded into his story seen below depicts the sacrifice of America to moloch. Mentioning also that the takedown of America plan of the globalists would have certainly been fast-tracked had Hillary Clinton somehow gotten into office, near the 5 minute mark of this video, the conversation turns towards ‘the plan’ of the Weather Underground and Barack Obama mentor Bill Ayers to introduce a Marxist/Communist government into America that would usurp the US Constitution and the Bill of Rights and as Sean tells us, he truly believes that Hillary Clinton would have been the final nail in our coffin. Mentioning the 1970’s warning given by the FBI agent who had infiltrated the Weather Underground, Larry Grathwohl, who had warned that the Weather Underground really believed that tens of millions of Americans would have to be thrown into ‘re-education camps‘ and that probably 30 million Americans or more who couldn’t be ‘re-educated‘ would have to be ‘terminated‘, Sean tells us that while that sounds like craziness and lunatic fringe babbling, it’s also exactly what happens when socialist/communist systems have taken hold throughout history. As we have previously reported numerous times on ANP, whether the regimes of Joseph Stalin in Russia or the Communist regimes of China, history proves that when communist/socialist systems come into nations, mass deaths always seem to follow and to the tune of tens of millions of culled human lives. Is that why the mainstream media has been so incredibly silent about the existence of the global government they’ve been attempting to bring in to America, because they know such forms of government are nearly always followed by mass cullings and massive numbers of human deaths? From this 2013 story over at Reason.com. Curiously, all of the world’s worst famines during the 20th century were in communist countries: China (twice! ), the Soviet Union, and North Korea. And as we see in this July story from the Chicago Tribune, those numbers have gone way up since 2011.